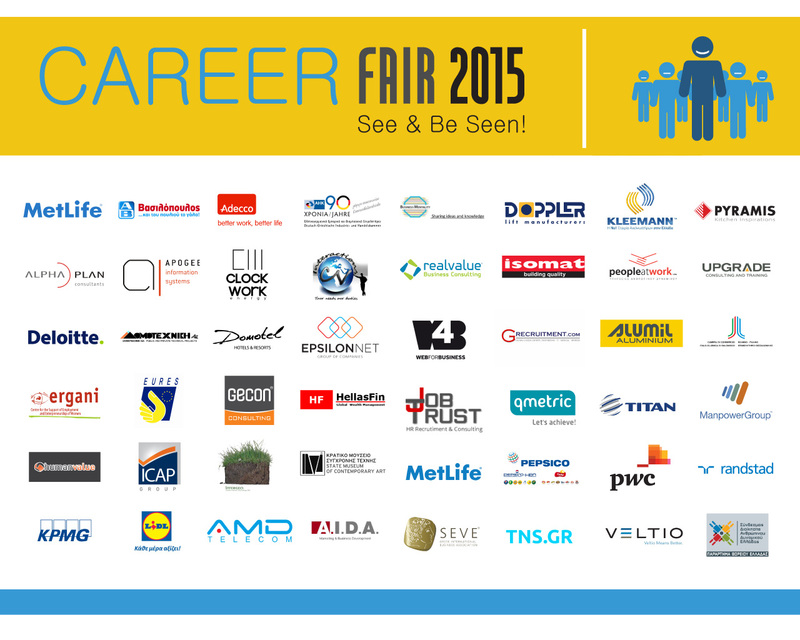 For the fifth consecutive year on Thursday, 7th May 2015, the International Hellenic University’s top annual career event “Career Fair 2015” took place at the Nikopolis Hotel, Thessaloniki. 54 companies and organisations – 18 for the first time – were present to discuss career opportunities with students from the 3 Schools of the University. 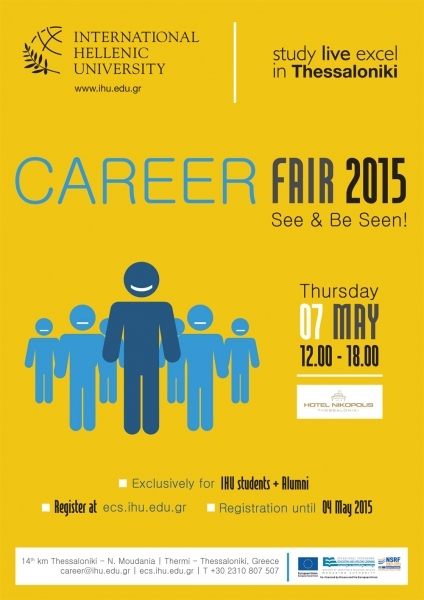 This year, for the first time, there were also parallel presentations and workshops during the Career Fair. More specific, there was a presentation delivered by the Greek People Management Association (GPMA) and Web4U, a start-up company founded by IHU graduates and also consulting workshops for a successful career organized by the companies People at Work and CV Interactions. During the event, the Vice President of the IHU Governing Board Professor Nicolas Moussiopoulos, on behalf of the University, thanked the companies for their participation and the support offered to the students in their search for employment. Employers had personal interviews with students, and informed them about employment opportunities and internships in Greece and abroad. Most companies had offers for jobs and internships currently available. In addition, the students were informed about the current situation in the global job market, received practical advice and had the opportunity to network with companies’ executives. It is worth mentioning that this year the students had the chance to attend a preparatory workshop organized twice by the Careers Office entitled “Getting the most out of a Career Fair” which enabled them to be properly prepared, while the Careers Office also offered individual counselling sessions to those students seeking personalized support. Among the positive outcomes of the Fair should be noted the desire of participating companies to develop the cooperation with the International Hellenic University, the fact that new companies were added to the International Hellenic University’s web portal Business Gateway and the excellent feedback from both companies and students concerning the organization of the Fair.